At Building Beautiful Souls we are all about positive messages of encouragement and healing. We are also about real truth. While some readers and teachers of tarot approach The Death card from a “love and light” perspective, sugar coating its meanings to simply mean change or new beginnings, etc., we are going to call it what it is – Death. Yes, the Death tarot card symbolizes rebirth. But before you can be reborn, you must “die” first. And, sometimes, that can really hurt. Even if the forthcoming change, new beginning or rebirth is about something as “simple” as a job change, the falling away or leaving of the old job can feel like a literal death in the querent’s emotional field or heart chakra. That said, though The Death tarot is a predictor of uncomfortable and potentially scary transformation what you are gifted with after that transition is profoundly beautiful. See how the sun is rising between the two towers in the distance of the Death tarot? Those towers form a gate, the gate to a higher, eternal life. 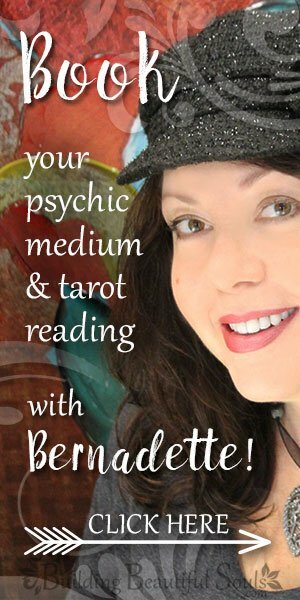 In this, the Death tarot points to an experience that will open your eyes to what is truly important. The color symbolism in the Death tarot is almost powerful enough to tell the story on its own. The lower portion of the Death tarot card is dominated by yellow (intellect and spiritual awareness) and blue (the subconscious and intuition). The transforming activity of black and white (death and rebirth) raises the consciousness through the blue waters of the cosmic womb to an awareness of its eternal, spiritual destiny, symbolized by the yellow sun and grey sky of the Death tarot card. The realization that everything has a higher, spiritual purpose can be overwhelming. Believe it or not, it is an unavoidable, irresistible force, very much like the black rider on his tall white horse. In the Tarot, horses symbolize movement, power and freedom. The transformation signaled in the Death tarot is an inevitable process. You can’t avoid it, no matter how hard you try. Death comes to everyone, regardless of rank, gender, talent, or accomplishments, and this realization can happen at any point in your life. It is the beginning of a personal transformation leading to an understanding of genuine spirituality – the certainty that the soul is immortal and indestructible. The white rose represents sacred love and rebirth on the Death card. This symbol is on the rider’s banner, meaning that this message is especially important in the Death tarot card. When The Death tarot card comes upright in a reading, it’s a sign that you’re reaching a point in your spiritual development or day to day life where the old way of doing things just doesn’t feel right anymore. And, huzzah! This doesn’t bother you in the least. Change is in the air, and you are ready to let go of old dogmas, phobias, or habits. You understand that their value was only temporary, and you are ready to leave them behind for something of lasting value. Parting with the old may come as a shock at first, but you know that this is a change for the better. At the end of Cast Away, Chuck Nolan loses his “friend” Wilson the volley ball. That’s certainly one of the saddest parts in the movie (we boohoo’ed up a storm! ), but giving up Wilson is much better for Nolan than having to spend another four years on that desert island (no matter how fresh the crab legs were!). Whatever this change may be, it’s B.I.G., and the insights you are receiving will affect the rest of your life. It could well impact your physical circumstances but more importantly, it will provide you with a sense of clarity: a better understanding of who you are and your place in the universe. When this change is complete, you will no longer be the same person. Because the change brought about in the Death tarot card is accompanied by a heightened understanding, its most noticeable effects concern your attitude and the way you perceive situations and people. In this process, your understanding of spirituality may change, and as a result you may express your religious beliefs differently – you may even convert to a different faith. This death and rebirth experience may well include important changes in more “mundane” areas of your life, such as switching careers or moving to a faraway location. You cannot fight what’s happening right now. Things have reached a breaking point, and trying to resist will do nothing to help. You can band aid that same old wound only so many times. Death reversed suggests delays or an unwillingness to make seemingly painful, but necessary changes. In this respect, it is similar to The Tower reversed. As in The Tower reversed, this reluctance tends to make a bad situation worse. The crucial difference is that in Death reversed, the change will happen anyway. But it will take longer and be more painful. “Denial” sums up the reversal of this card rather well. Here, spiritual insight give way to repeating worn out rituals and prayers that lose more and more of their meaning for you with each repetition. Instead of uplifting you the way they used to, they become just another chore, like doing the laundry or taking out the trash – even though the divine consciousness has shown you a way to restore your faith and spiritual life. You may have declined a company assignment in another city, because you feel that you have compelling reasons for staying right here. That assignment may have offered chances for advancement that aren’t likely to come to your town for years. Are you stuck in counterproductive behavior and thinking patterns? Holding a grudge is a good example. It’s one thing to avoid contact with a person who has done you wrong. But once that person is out of your life, staying angry will only hurt you in the end. Prejudice is another example, because it closes doors to important opportunities from which you could benefit greatly. Denial often includes clinging to unhealthy relationships, whether they are romantic or not. For example, if you are recovering from chemical dependency, it is generally not a good idea to keep your drinking or using friends. 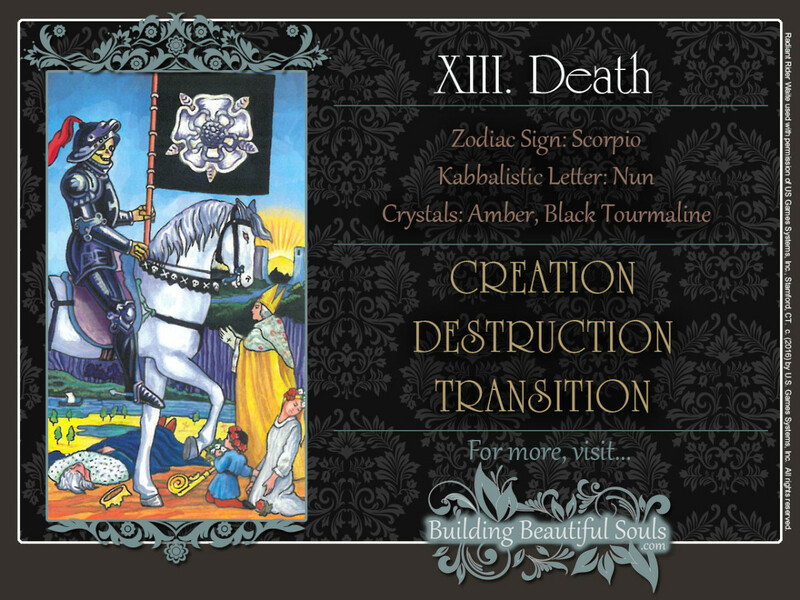 The Death card is the thirteenth Major Arcanum. Composed of 1 (the creative force of the cosmos) and 3 (here: the cycle of life, death, and rebirth), these two digits add up to 4, symbolizing stability or in this case, inevitability.